Mei Mei's Street Cart have opened up a pop-up diner at the Bethnal Green Working Men's Club to run Thursday - Sunday, from November to February. There's no set menu, and prices range from £4.50 - 10.50. they also have a cocktail bar, where all cocktails are £6, 2-4-1 cocktails on Sundays. Happiness Diner indeed! 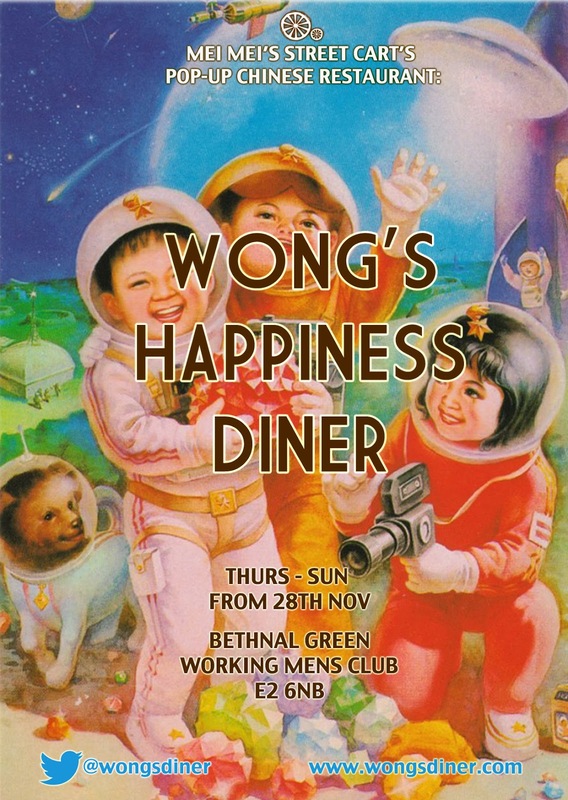 "Jian Bing enthusiasts, Mei Mei’s Street Cart are pleased to announce the opening of their new pop-up restaurant, Wong’s Happiness Diner situated on the top floor of the infamous Bethnal Green Working Men’s Club. The menu changes every week, and features homemade Chinese dishes with an emphasis on traditional cooking methods, sharing platters and MEAT (but veggies welcome too). Signature dishes are the Piggy Ribs (falling-off-the-bone tender, yet crispy Ribs smothered in a salty, spicy Peanut Chilli sauce) Wong’s Wings (Crispy Chicken Wings in a sticky, sweet, fragrant glaze) and Braised Szechuan Aubergine (slow braised in Szechuan sauce and topped with a crispy fried egg!) and will remain on the menu throughout the pop-up. All can be ordered as a small or larger plate to encourage communal face-stuffing in true Chinese fashion. Weekly specials will range from hearty soup noodles to slow-braised pig’s trotters. For the 2 weeks before Christmas, a 3-course set Christmas menu will be available for private parties, and will include things like Pork Belly Bao, 48 hour bone broth Soup Noodles topped with roasted meats, and wild Chinese vegetables. Desserts are produced in collaboration with Islington-based Batch Bakery, famous for their utterly gluttonous brownies and cakes, and who have concocted an array of Oriental-tinged, sweet things, exclusively for Wongs. The Bar will also serve delicious cocktails with an oriental twist as well as a range of Chinese Beers. The venue also has a basement Boat Bar that is available for larger parties. Wong’s was dreamt up by ‘terrible twins’ Oliver and Melissa Fu - half American, half Chinese Londoners who became depressed with the heavily anglicised Chinese food in London and realised people don’t really want to eat radioactive sweet and sour “chicken”. Armed with business spirit passed down through their Chinese wholesaling family business, the cooking knowledge passed on by their grandmother, the twins have brought to life Chinese cuisine through the dishes they love, and grew up stuffing their round faces with."